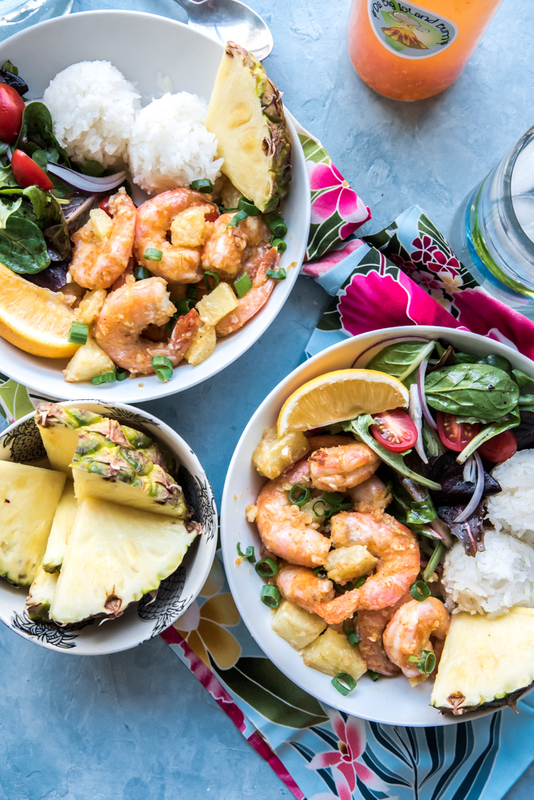 Spicy Hawaiian Garlic Shrimp with Pineapple is a sweet and spicy version of the famous Hawaiian garlic shrimp that can be found at shrimp trucks on several of the islands. 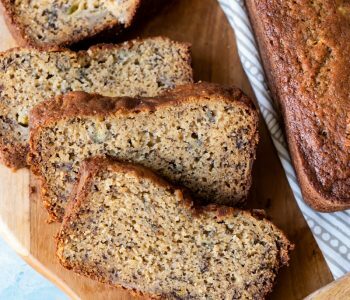 I first had this version when I visited Maui a few years ago, but it took a trip to the Big Island of Hawaii last summer to get the one ingredient I needed most to recreate this recipe at home. Hawaiian Chili Pepper Water. 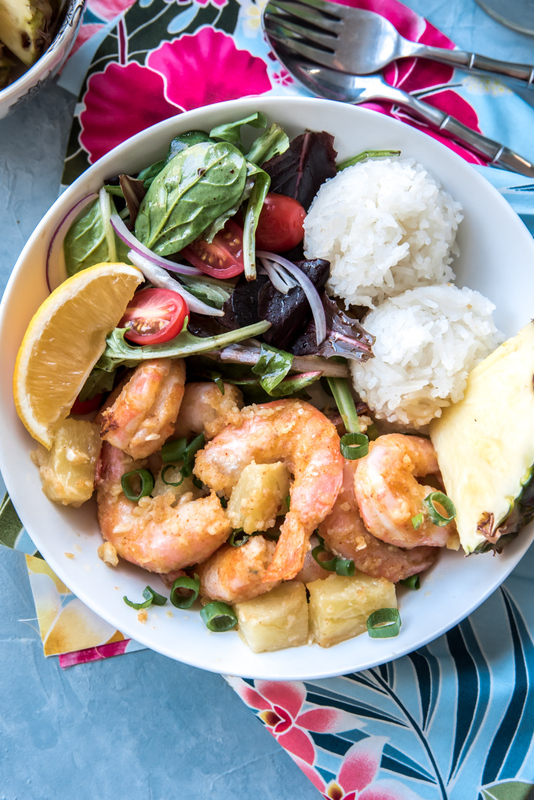 Hawaii is known for its beaches, warm oceans, palm trees, gorgeous mountain scenery, sunsets and garlic shrimp. 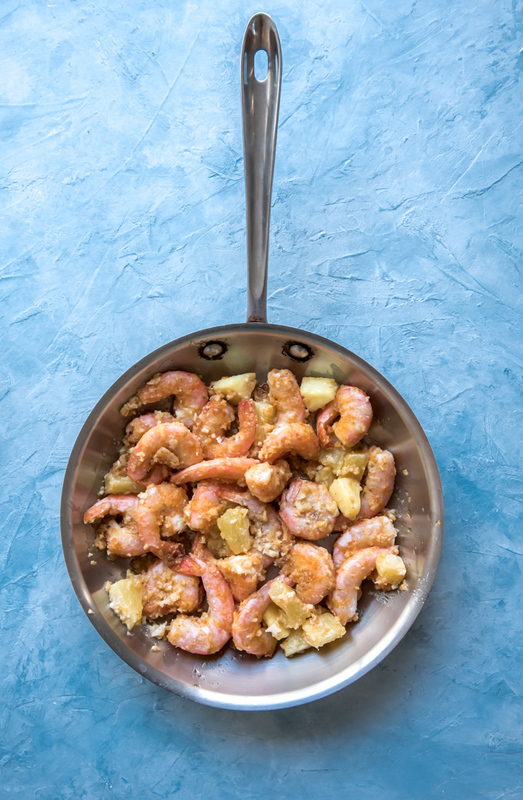 Well, it’s known for lots of other things too, but garlic shrimp is up there. 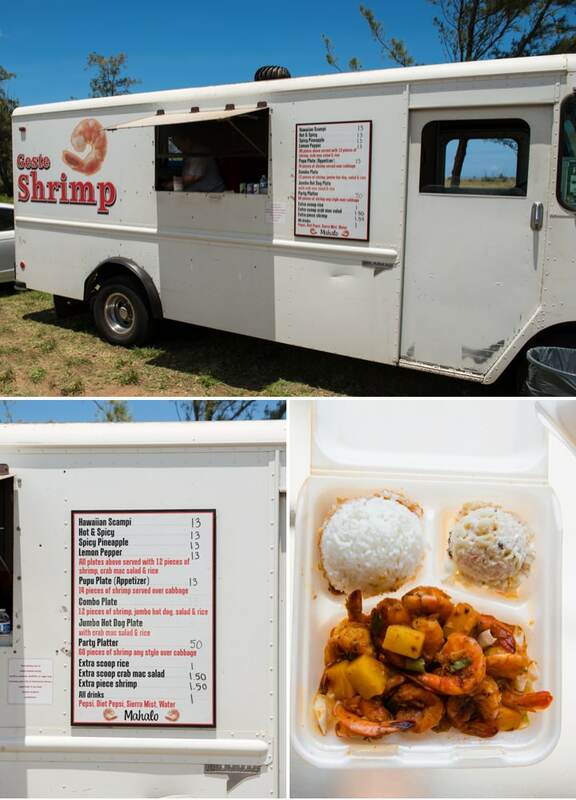 If you have ever traveled to the north shore of Oahu or around the harbor in Kahului, Maui you have seen the two most famous shrimp trucks, Giovanni’s (Oahu) and Geste ( Maui). You can smell the garlic before you see the trucks. 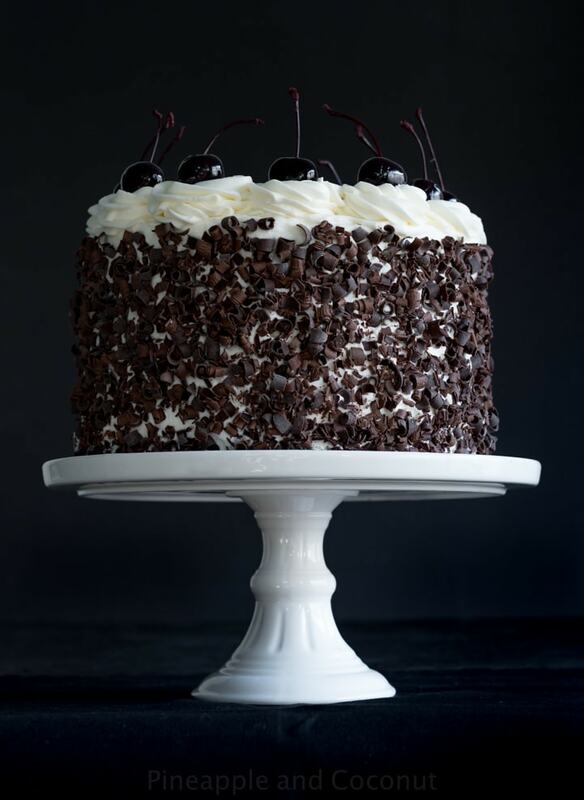 Its beyond amazing and makes one instantly hungry. When we were in Maui a few years ago, Geste was a must stop when in Kahului. When we arrived there was a huge line waiting to order and waiting for orders as we pulled up to the side of the road where the truck was parked near Kahului Harbor. We stopped by after we had spent the morning at the Maui Swap Meet by the community college. By the time we ordered we were the only ones left waiting and I stood at the window watching them cook because I wanted to see how the shrimp was made, being a nosy food blogger and all. 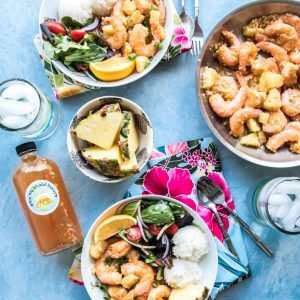 One of the ingredients I spied, besides buckets full of chopped garlic, melted butter and prepped shrimp, was Hawaiian chili pepper water. I asked a few questions about the recipes, how many orders a day they made, if they smelled like garlic all day every day, etc. 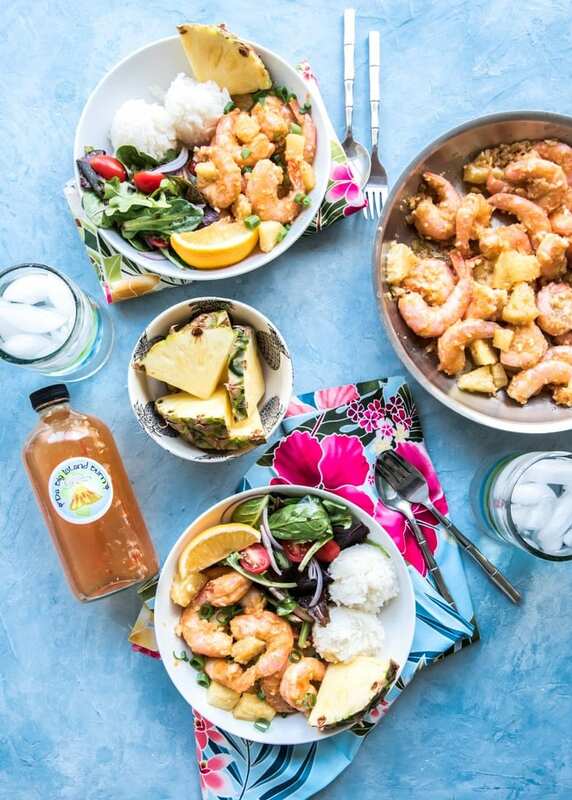 I learned that the Hawaiian Chili Pepper water was their secret to the spiciness of their spicy hawaiian garlic shrimp with pineapple. Wonderful people working there, clearly a passion for everyone involved, I could have sat and talked story with them for days. When we got home from Maui this was one of the recipes I wanted to recreate. Unfortunately the only Hawaiian chili pepper water I could find in stores had red food dye in it. I try to be as natural with ingredients that I can be, some I avoid at all costs and red food dye is one of them. I know there are recipes online to make my own Hawaiian chili pepper water but I just never got around to it. Fast forward two summers and we headed to Hawaii for a month. A week on Oahu and three weeks on the Big Island. 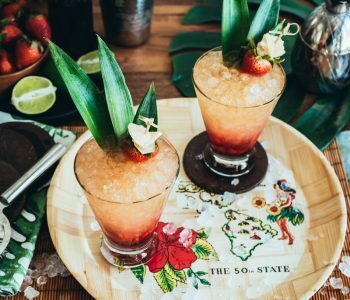 I had been following Edible Hawaii online and owning subscription to the magazine for a while at that point and had seen them mention a few new small hot sauce companies around the islands. Big Island Burn being one of them from Kona, Hawaii. A few messages back and forth on Instagram and I made plans to meet up Erin at her shop. Erin was about to start prepping mangoes, since they were in season at the time, to make her Mango hot sauces. I spied a bottle of Hawaiian Chili Pepper water and kind of freaked out a little since I knew it was all fresh local ingredients and no food dye. I told Erin I had plans to make recipes with her hot sauces and chili water after we chatted for a bit. She couldn’t have been nicer to chat with and I was really looking forward to sampling all her hot sauces and the hawaiian chili pepper water. 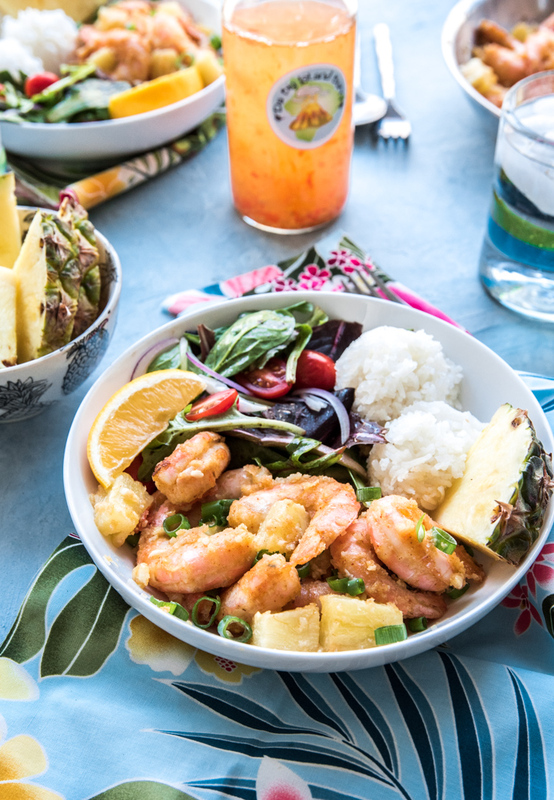 For this spicy Hawaiian garlic shrimp recipe I used just her Hawaiian chili pepper water, saving the rest of the hot sauces for other recipes. 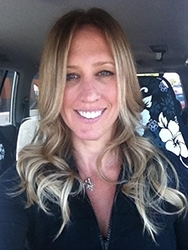 I also asked Erin a few questions about herself, her business and life on the big island of Hawaii. The rest of the post will be these questions and amazing answers! How did Da Big Island Burn get started? I’ve always loved hot sauce, it’s been my thing ever since I was a kid. I remember when my dad was in the first Gulf War, and they had the MRES or meals ready to eat. And in those, they had little bottles of Tabasco sauce. He would save those and send them home to me. It was a thing between my dad and I. When people go on vacation and they bring me back a gift, it’s almost always a local hot sauce. I have also always made some sort of spicy concoction for the fridge, like habanero relish, or what we used to call the “Jar of Death”, which was really just Thai or serrano chiles sliced thinly, packed in soy sauce, that I would keep in the fridge, or olive oil, salt and garlic on the counter, and pop in my mouth when I needed that extra kick. One year, our neighbor had a mango tree that was going off. He was bringing over boxes of mangoes everyday. I made mango sorbet, mango salsa, and then I thought, mango hot sauce! And that just kind of opened my eyes to all other possibilities. And I went with it. And here we are..
We are also one of the very, very few 100% female owned and operated hot sauce businesses in the world. I think that people sometimes underestimate our knowledge, and expertise, with heat.. Until they taste our sauces. I have lived in Hawaii for 5 ½ years. I initially moved here to open my own State Farm Insurance agency. They actually moved me here from Arlington VA, right outside of DC, where I had managed a large and successful State Farm agency for many years. Ultimately, the agency opportunity wasn’t the right fit, but the Big Island definitely was. It’s very suited to my personality, and my lifestyle, and I am proud to call it home. 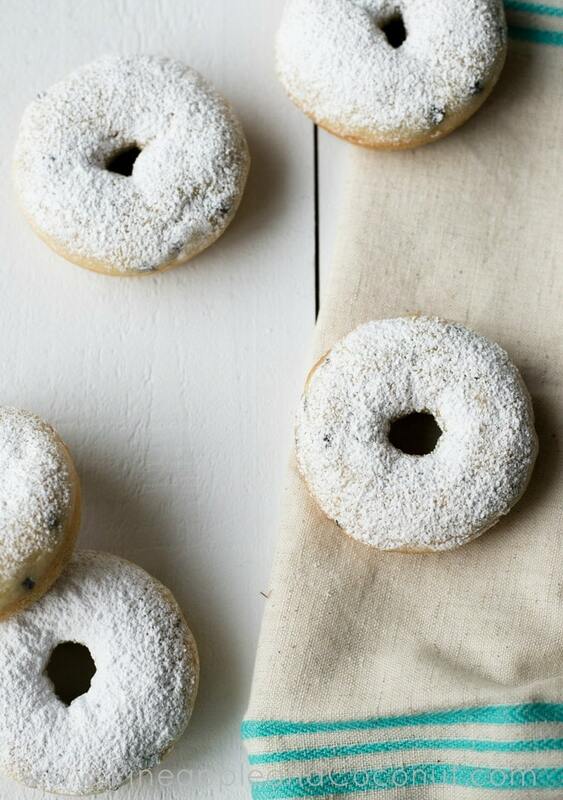 Which is your favorite ingredient to work with? I love working with chiles, all different kinds, but in particular, the Hawaiian Chile Pepper. A lot of people don’t understand the nuances of different types of chiles, not just their heats levels, but their flavors, and where their heat hits. The Hawaiian Chile pepper is so great in that it has amazing flavor, but it also provides a nice back heat, so you can taste all of the other ingredients in the hot sauces as well. People are constantly amazed when they try some of our fruit based hot sauces, their reactions tend to be, “Ooh, that’s a nice Mango flavor, and ooooh, there’s the heat”. It’s my favorite thing to see, like we are all on a flavor roller coaster together. We make a variety of different hot sauces, in a variety of flavors and with different heat levels. 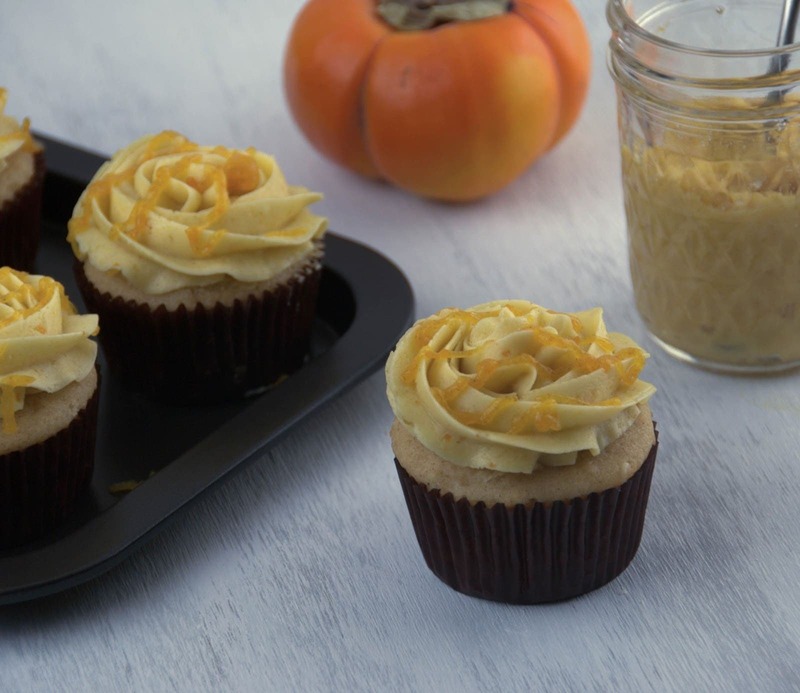 The one constant is that we source as many of our ingredients locally as possible. 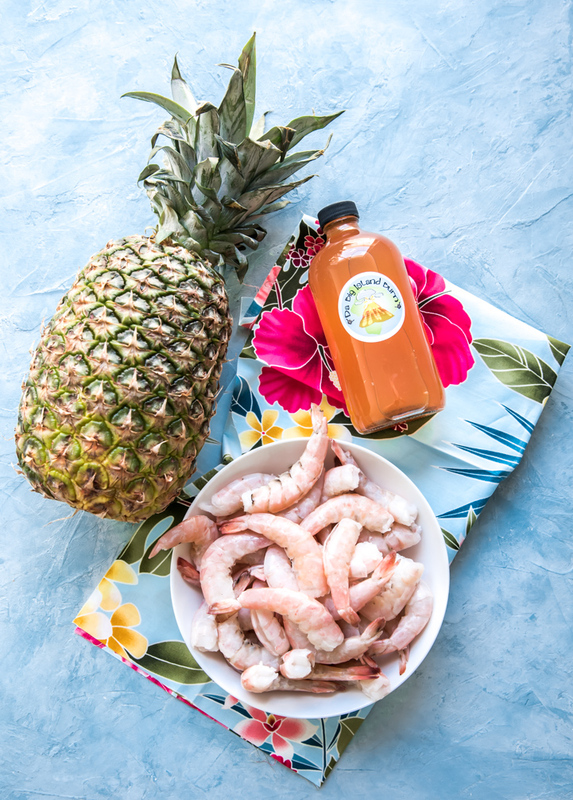 We only use locally grown mangoes from the west side of the island, local honey from down south, all of our chiles are fresh, and grown right here on the Big Island. In our award winning Kona Coffee Kiss and Kick hot sauces, we only use 100% Single estate Kona coffee that we get directly from the farmer himself. He even has a special grind for us. Nothing comes from a can, or concentrate, we break down all the fruits by hand in our commercial kitchen. 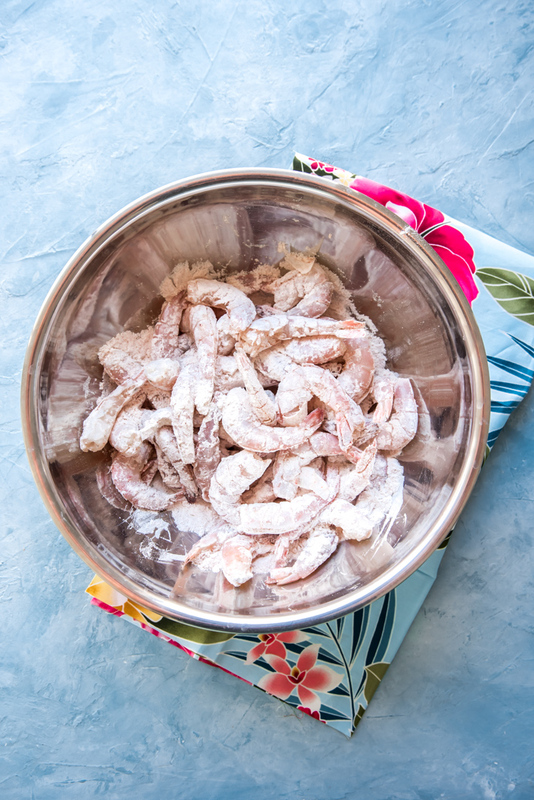 I find that knowing where my ingredients come from gives me more of a connection with them, and that translates into more Aloha in our hot sauces. Best part of living on the Big Island of Hawaii? What do you like to do on your days off? The best part of living on the Big Island of Hawaii is the people. Of course, the beaches, mountains, waterfalls and volcano are amazing too, but the people of the Big Island are really what makes this place so special. From the day I moved here, I have been welcomed with open arms, and I am truly grateful for it. I think when you move somewhere so different, like the Big Island, you have to come with a mindset of wanting to learn, and wanting to grow, and wanting to highlight what makes it such a special place, but with respect and consideration. If you do that, the island and the people recognize that, and take you into their fold with love and Aloha. Days off… are few and far between, but I like to save all my cooking magazines for my beach days. 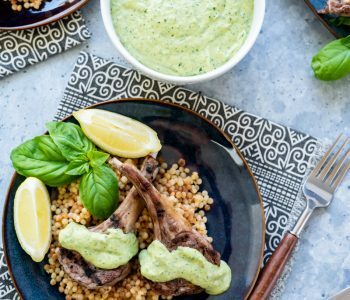 We pack a cooler, head up north to one of the amazing, sandy beaches up there, and relax and soak in the ocean and the sun, all while looking for more culinary inspiration in the magazines. We also are always at First Fridays in Holualoa (first friday of each month), where we also do a pop up taco tent, serving street style tacos with house made salsas, and at the Kokua Kailua Village Stroll on the 3rd Sunday of each month. Thank you Erin SO MUCH for these awesome answers. 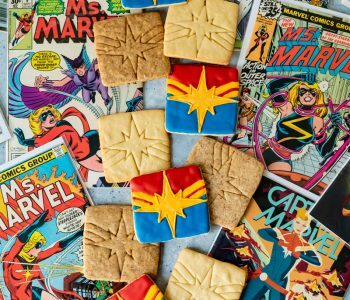 I hope if you all make it to the big island of Hawaii to stop by one of these shops, the Kokua Kailua Village stroll and the First Fridays in Holuloa. Both street events are so much fun with tons of different vendors from local arts and crafts to all kinds of food. I would plan your trip to the big island to include at least one of those events. And tell Erin I sent you! 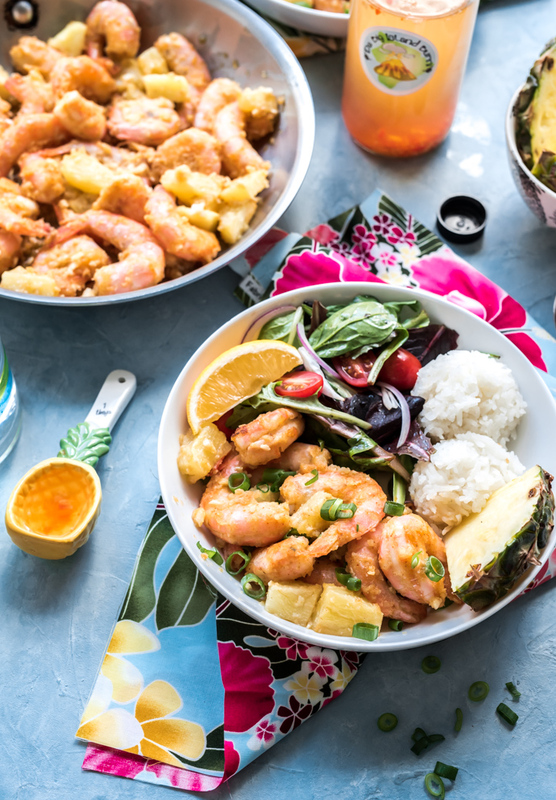 Now on to the recipe for this amazing spicy Hawaiian garlic shrimp with pineapple!